Home » Eyes » Eyeshadow » Shiseido Shimmering Cream Eye Colors : I Never Thought I’d Wear Orange and Pink on eyes! 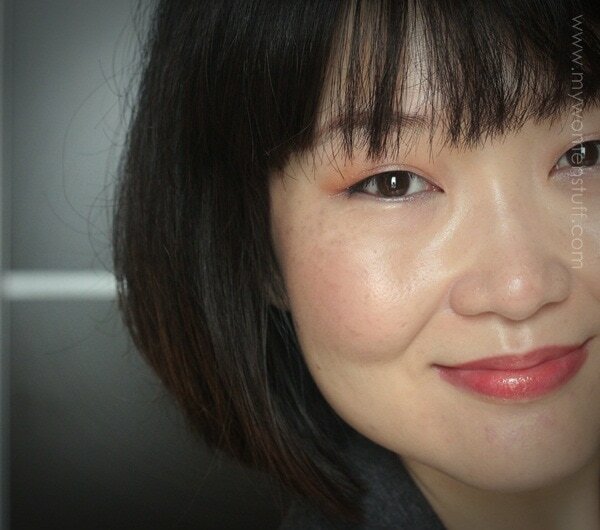 Shiseido Shimmering Cream Eye Colors : I Never Thought I’d Wear Orange and Pink on eyes! The one benefit I find using cream shadows, is the ease of use. In most brands (I happen to like the Benefit Creaseless Cream shadows) its pretty much swipe and go. No need to fuss and faff about and they blend very easily. Now, I’d tried Shiseido’s earlier offering of a cream shadow before this – Hydro something? I didn’t like it. So I faced the newer Shiseido Shimmering Cream Eye Colors with a little trepidation. The colours I have, happen to be colours I’m not quite into which I will say makes it hard for me to say that I LOVE these even though I do LIKE these. BR306 is a warm red toned brown that I believe would look lovely on those with a warmer skintone but on its own, it made my eyes look tired. I tried wearing it with gold but it didn’t work. If you have a warm skintone though, do check it out though, I think it would work on you for a really quick and easy day/work look. PK214 Pale Shell and OR313 Sunshower are 2 new (permanent) shades in the range for Spring/Summer 2012, together with BL214 Ice, a pale shimmery blue (not featured). When I saw PK214 and OR313 in the tub I must confess to my heart sinking. 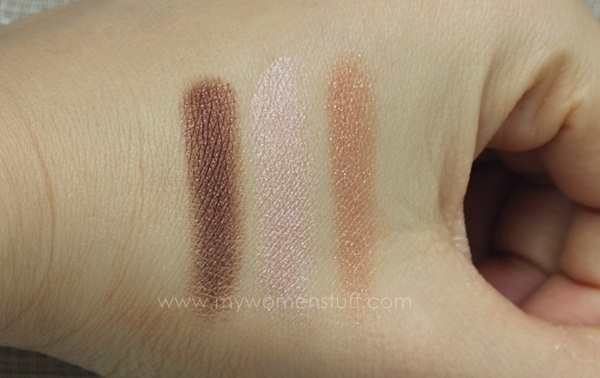 When I swatched them, my heart sank further. How was I supposed to wear colours like these? Pinks? Browns? Orange? I’m afraid they aren’t quite me. On someone with a warmer skintone, they would be gorgeous! On me? The colours are strong, but you can sheer them out on the skin very easily. I dabbed some OR313 in the outer part of my lid and then applied the PK214 on the inner corner and blended them where the two colours meet. The orange isn’t as scary as it looks and is in fact quite a nice effect due partly to the shimmer. I also lined the upper lash line with the BR306 and the lower lash line with PK214. It really brightens the eye! The shimmer in the Shiseido Shimmering Cream Eye Colors are there. Brilliantly shimmering, which if used sparingly, is lovely. It isn’t glittery but it is most definitely shimmery. If you are afraid of shimmer, you will not like this. The texture is very smooth and almost silken to the touch. It spreads easily and on my lids, stay on all day. The shimmer stays on too till evening without migrating one bit. That last point really impressed me. I did find that the 2 new Spring/Summer 2012 ones PK214 and OR313 were more shimmery than BR306. I’m not sure how the other colours are, or if it is just the new texture that is more shimmery. See what I mean? “Natural” – inverted commas required 🙂 Barring BR306 which I do not like, I’m quite happy with how PK214 and OR313 turned out. 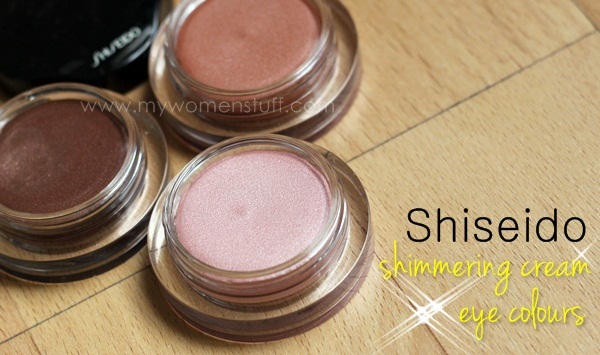 Shiseido Shimmering Cream Eye Colours are cream shadows infused with shimmer. The texture is very smooth, velvety and creamy but they are also very shimmery which may or may not appeal to the majority. I like that because the shimmer doesn’t migrate and stays on the skin. The colours apply a little more sheer than what you see in the tub which again, may or may not appeal. I think they are good for a very quick eye look on days when you don’t want too much hassle. They add just the right amount of perkiness to the eyes without being too obvious. I do not know how it fares on very oily lids though as on mine, they last all day. Juan who has oily lids reports that it lasts on her lids for hours. On mine, it pretty much goes without saying. I rarely experience creasing so when I do, its a big deal and I’m sure to mention it. You can view some of the permanent shades available over at Makeupstash. I apply these with fingers. I find that the easiest way. Do you own any Shiseido Shimmering Cream Eye Colours and have a colour you’d like to recommend? Or have you tried these and have your thoughts to share? Would you willingly pair orange and pink on your eyes? 😀 It isn’t half bad you know. I’m quite happy with it and with the sheer texture and shimmer, it actually looks perky and fresh! PREVIOUS POST: When the worlds of Fashion and Cosmetics collide: What do you think when fashion companies branch into cosmetics? Oooo the orange and pink is a nice surprise! I wouldn’t have dreamt of putting both colours on my eyes but you really pulled it off! Off topic – but what foundation/face products do you have on here? I like the fresh glow. 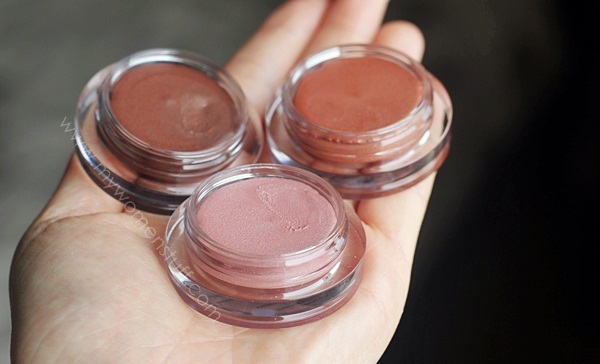 I have these cream shadows in Patina and Sable. I have oily lids and these shadows crease on me if I worn on its own. Primer is very much needed, and setting it with powder makes it stay even longer. Compared to other creams I have, namely Bobbi Brown, Estee Lauder, MAC and Chanel, these ones have the least staying power. I envy your non oily lids! I don’t own any cream shadows (previous bad experiences!) but I love the orange. Not at all what I expected. my lids are somewhat oily especially at the base, and I find these wear quite well. I have the pewter and the khaki brown; pewter is a very lovely cool bluish-gunmetal which is a bit too cool for me, but the khaki brown is very easy for a polished look. I love the texture! So easy to apply and build up, and they work very well as bases. Hi Paris! thanks to your post that i am wearing orange shadow today! and now i am thinking…. if we use a coral blush…will it works? hmm…can we put blusher on eyelids? Ahhh I see… Okay.. Better don’t go over the rule!! Thx for the advice Paris!!!! but i was eyeing on the blue palate!!! I love the shiseido shimmering cream eye colours. I bought the orange colour too. I think the orange colour will flatter anyone who use it. But I find the formula almost as same as Majolica Majorca cream eyeshadow. Good that you don’t have oily eyelids. I’m learning (from ground zero) the nuts and bolts of eye shadow, and I find the biggest issue I’m to solve is how to make the color last for some hours on my oily eye lids. cantik, right?? i love them so much! my first cream shadows that work like a charm. like you, i do have the intention to check out other colours. they are so wearable and workable. even the packaging is so minimalistic and easy to carry around. Thank you S 😉 which are your favorite cream shadows? I wear the orange from the Nyx Secret World palette. I haven’t tried orange on my eyes, but I’ve been eyeing the Dior Aurora palette. With the combination I MIGHT be able to make it work. I have recently acquired a L’Oreal infallible eyeshadow and two Maybelline 24-hour color tattoo eyeshadows, but otherwise my experience with cream shadow is really limited! Looks GORGEOUS on you!! I need to try one of these-I never have but have always been curious.